11:45 a.m. Remarks by Elizabeth Schnee, creator of Statue Paperweight 11:50 a.m. Recital of Wynken, Blynken, and Nod Poem by Mrs. Carr’s third grade class. The Borough of Wellsboro is proud to announce the 200th anniversary of Wellsboro by holding a Bicentennial Celebration on Saturday, May 27th 2006, on the ‘Green’ in Wellsboro. The event will begin at ten a.m. and include the planting of an elm tree, musical selections, the recitation of the Wynken, Blynken & Nod poem, guest speakers, as well as the burying of a time capsule. The Elm Tree has been donated by the Shade Tree Commission. "Borough of Wellsboro, Founded in 1806. A Proud Past and a Promising Future. This Time Capsule was placed on May 27th 2006 to commemorate Wellsboro’s Bicentennial with the hope that it be opened on the Tricentennial." Support for the event has been wonderful. Tussey Mosher Funeral Home in Wellsboro has donated the vault. Inside the Vault is another sealed container forged and donated by our own Tin Man, Tim McConnell. Local artist James Fitzpatrick has contributed some of his best photographs for the creation of a commemorative post card as well as for invitations to the event. The PPL Gas Company paid for the invitations to the event. The Wellsboro Gazette designed and printed the invitations and will also print a special insert in the May 24th edition of the Wellsboro Gazette. 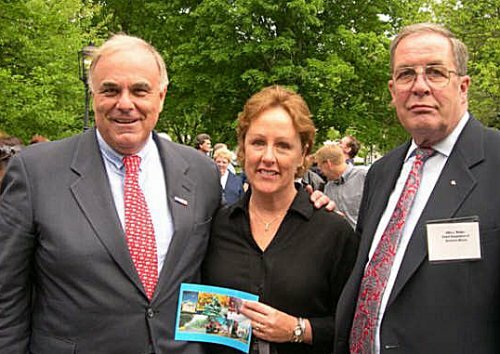 Governor of Pennsylvania, Edward Rendell, Pam Walker and her brother Allen Walker, Morris - Wells Descendants, at the 200th anniversary of Wellsboro. Wellsboro is named for Mary Wells, ancestor of Pam and Allen. "Borough of Wellsboro, Founded in 1806. A Proud Past and a Promising Future." All proceeds from the sales will go toward the upkeep of the Wynken, Blynken & Nod fountain. Among the speakers we are honored to have Allen Walker, a direct decedent of Wellsboro’s Founder Benjamin Morris, State Representative Matt Baker, paperweight creator, Elizabeth Schnee, Tioga County Commissioner Mark Hamilton, and the Wellsboro Borough Mayor and Borough Council. The Bicentennial Celebration begins on the Green at 10:00 a.m. and ends at noon. A Birthday Cake, prepared and donated by Weis Markets, will be shared by all. Please attend and join in the Celebration! Thank you, Mr. Coolidge. Governor Rendell, Representative Baker, Commissioner Hamilton, Mr. Dugan, Ms. Schnee, Ladies and Gentlemen thank you for inviting me here today to be a part of the Grand Occasion. I have been asked to speak on Benjamin and Mary Wells Morris, but as they remain to be somewhat of an enigma even unto this day, I thought I would give you a summary of their history. Anthony Morris I. He was born in 1630 and grew up to become a Mariner who sailed between England and Barbados. He was married to Elizabeth Senior. On one of his trips he died at sea and was buried in the Barbados 1655-6. His wife went there to settle his affairs and died a short time later leaving an orphaned son Anthony behind. Samuel Morris was born in April 1734 in Philadelphia. He also served an apprenticeship and when completed continued in the family businesses. On December 11, 1755 he married Rebecca Wister, Daughter of Caspar Wister, a noted Glassmaker from Hilsbach, Heidelberg, Germany and Margaret Jansan of Germantown. Note: Rebecca’s nephew was Caspar Wister II who was a noted Botanist at the University of Pennsylvania for whom the flower Wisteria is named. In 1765 Samuel was a subscriber to the “Non-Importation Resolution” of October 1765. It was the first “Pledge of Honor” before the Declaration of Independence. Samuel Wells Morris, born on 1 Sept 1786, in Philadelphia continued to live in Wellsboro with his wife Anna Ellis, who was born in Germantown on 7 May 1791. He became a Judge, then later a Member of the State House of Representatives. Their son Benjamin Wister Morris became the Episcopal Missionary Bishop of the Oregon territory. Their daughter Sarah Ellis Morris married Joseph Paschall Morris, Benjamin and Mary’s nephew. They built the Wren’s Nest in Mansfield. They were our Gr, Gr, Gr, Grandparents. And therein ends my story. In closing I would like to read an excerpt from a volume of the Morris Family of Philadelphia, by Dr. Robert C. Moon, published in 1898. 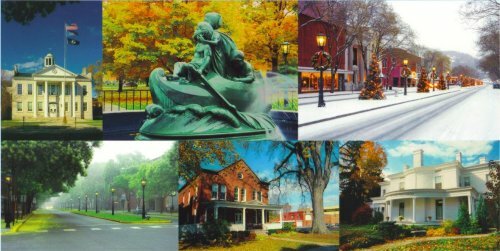 “At the beginning of the present (19th) Century Benjamin and family removed from Philadelphia to Tioga County where they settled and several of their descendents still reside there.” “Wellsboro, the county Seat, is one of the most pleasant and entertaining towns in Northern Pennsylvania. It received its name in honor of Mary Wells Morris, wife of Benjamin Wister Morris. I ask you: What better love hath a man for his wife than to honor her as such? The history of the Benjamin Wistar Morris family is “a convoluted story,” says Allen Walker. He should know. He’s a descendant, and he’s been a student of the family’s genealogy for years, thanks to an interest sparked by his grandmother, Louise Lyon. He’ll share some of what he’s learned this coming weekend during Wellsboro’s bicentennial celebration. Here’s a preview. 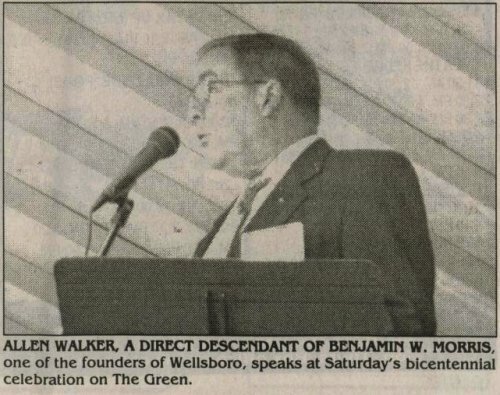 Everybody knows the history of Wellsboro, says Walker, who has returned to live in his hometown of Mansfield after a career in the military and with Gruman Corporation, but nobody seems to know that much about Benjamin Wistar Morris except that he was sent here by his father. There are pictures of Benjamin’s family members, but none of him nor of his wife, Mary Wells Morris. The Morris (Walker’s relationship is traced on his mother’s side) family has been in this country a long time, Walker continues. Some members were part of William Penn’s original party, though they did not travel to America on the same ship. The Wistars were from Germany, near Heidelberg. Caspar Wistar (whose first meal in the New World was bread and apples, according to family history) married a woman named Margaret Jansen. Their daughter, Rebecca Wistar, married Captain Samuel Morris in 1755. Benjamin Wistar Morris, born in 1767, was their son. “Captain Sam,” Walker says, is a family hero. His great, great grandfather, Anthony Morris, arrived a month after William Penn and settled in Burlington, New Jersey. There were no houses in Philadelphia at the time, Walker says. People were living in caves along the Delaware, and so it was several years before the first Anthony Morris moved to Philadelphia. Anthonys II and III were in the brewery business. In addition, Anthony II became involved in politics and Anthony III was a mariner. Anthony IV was the father of Captain Sam. In his capacity as a brewer, one of the Anthonys refused to buy a shipload of malt from England (this was before the Revolution), and the ship was forced to turn around and take her cargo back to the homeland. “So much for the Boston Tea Party,” Walker notes. Mary Wells’ family was English. Her grandfather, many generations’ back, was a contemporary of Henry VIII, and another Wells was captain of York Castle. Her mother was Sarah Powell, whose family came over with Lord Baltimore and settled Maryland. Family history says this line is descended from Alfred the Great, though Walker says that may not be provable. “You have to be very careful, as if you’re going to lay claim to something you have to document it,” he says. As for Benjamin and Mary, they were married in 1785, and so were not exactly newlyweds, nor young, by the standards of the day, when they made the trek north. It is fascinating to speculate on the reasons why they came, but, regardless, they did. The history of your own family is no doubt as “convoluted”. For those interested in genealogy, Walker recommends starting first by talking wit6h parents and grandparents. 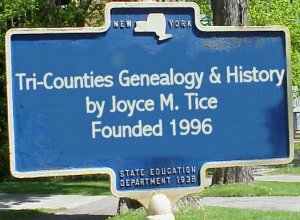 Some other good sources of information include the New England Historical and Genealogical Society, The Daughters of the American Revolution, the Military Order of the Loyal Legion of the United States (founded by General George Meade), and various local groups, like the Tioga County Historical Society. Walker says he has a lot of assistance from Mainesburg resident Joyce Tice - ‘a good friend, classmate, and cousin.” She can be found via a Google search of “tricounties genealogy and history”. Get started - your ancestors are waiting! No riding horses on the sidewalks! That was the law in the borough of Wellsboro in 1899. The volume “Laws and Ordinances for the Government of the Borough of Wellsboro” in force Jan. 1, 1899, was published by The Wellsboro Gazette. There were a few different kinds of borough jobs and officials then; the rules and regulations those men (no ladies mentioned as elected or appointed officials) made and enforced are definitely a reflection of a bygone era. Those same animals needed to be kept under control. “No horses, cattle, mules, sheep, goats, swine or geese shall be suffered to run at large in said borough… It shall be the duty of the Pound Master to impound all horses, cattle, etc. found running at large…” If the poundage fee was not paid, the animals could be sold, and the money, minus the Pound Master’s fee, put in the borough treasury. It was not lawful to hitch any horse, mule, or other animal to any shade tree (there was nothing mentioned about old, dead trees). There would be no horse racing in any borough streets. And, if you owned a dog, you paid a tax on it. The dear departed had their place, too. There was no burying of “ any deceased human body in any place within said borough other than within the limits of the grounds occupied by and controlled by the Wellsboro Cemetery Company.” Perhaps there had been problems in the past with folks ending up in the back yard? And if for some reason your final resting-place, in the yard of otherwise, turned out to be not so final, you still had to stay put for six months out of the year. There was no exhumation permitted between May and October, inclusive. Ordinance No. 96 dealt with the preservation of public health and preventing the spread of communicable diseases. To that end, there would be no bone-boiling establishment or depository of dead animals kept or erected in any part of the borough without a permit from the Board of Health. Further, there were to be no privy-vaults, cesspools, etc. located near wells and springs. Communicable diseases like smallpox, scarlet fever, measles, typhoid, hydrophobia, and leprosy had to be reported to the Board of Health. The following individuals were in charge at the time of this 1899 compilation. Borough officers were: S.F. Channell, burgess; George O. Derby, William A. Hammond, Peter E. Jackson, N.F. Marvin (died 1898), Walter Sherwood, A.A. Truman, all council members; F.H. Rockwell, attorney; Lee English, janitor; E.A. Ingerick, street commissioner; J.P. Longwell, M.H. Stebbins, and A.P. Dartt, all councilmen-elect; James A. Boyce, F.A. Deans, Anton Hardt, E.H. Owlett, M.C. Bacon, all members of the Board of Health.